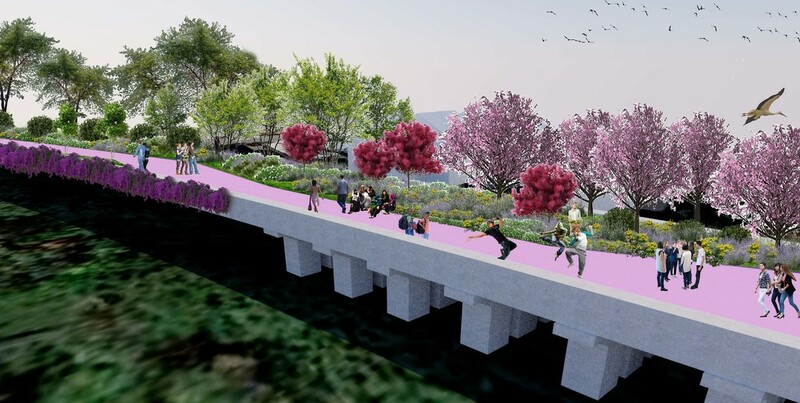 ​The Staten Island Economic Development Corporation launched a design competition for ideas to redevelop a half-mile elevated railway on the north shore of the island in Winter 2017. Our submission was entitled Water Line and strives to create a place that makes visitors happy, and where they can witness the beauty of nature. The design accomplishes this by combining the essence of Staten Island’s natural landscape with sustainability and design excellence. The primary element for the entire park is a man-made stream that runs the length of the North Shore Railway. The stream uses collected rainwater that falls on the park. The goal is to reuse and filter 100% of the rain making the park both a piece of stormwater infrastructure as well as an incredible public green space. It is this stream that gives the park its name, Water Line. The aesthetic of the park has a contemporary sensibility toward landscape design. The details of the park are modern with an emphasis on placemaking that welcomes and dazzles visitors with beauty. It also wants to give users a contemplative close-encounter with nature. These different attributes are provoked through the materials and plants selected for the design such as perennials, grasses, concrete and cor-ten steel. They are tied together by the presences of the naturalized stream moving throughtout the park. ​The stream will vary in width and depth from place to place as well as where it actually is in relation to the pathway. At times, the creek will flow next to the path. At other points, it will be several yards away from the edge of the walkway. 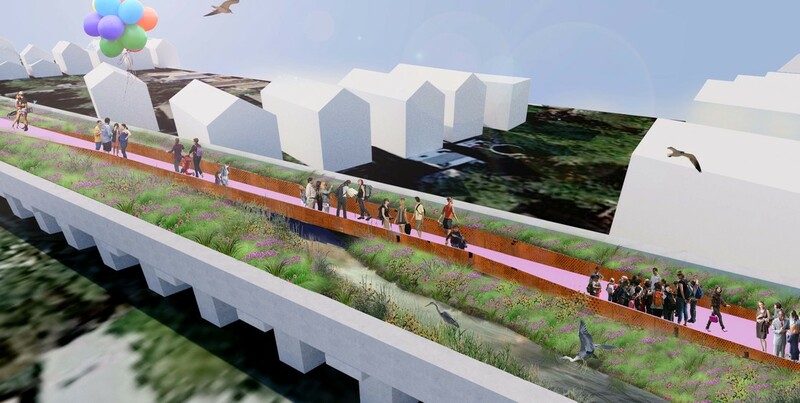 Where the park is between Maple Ave and Port Richmond Ave, the pathway will become a bridge flying over the stream creating vistas of both the moving water as well as the whole park from a higher point-of-view. Ecology drives the project. The park will intermingle dry meadow wildflowers, trees, shrubs, wetland grasses, native sedge, fern and many other types of flora throughout the park. 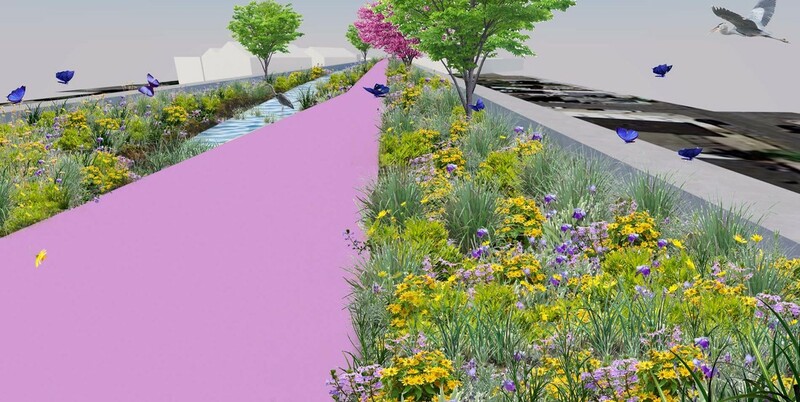 All of the plants will be native to the New York City area, or that are adapted to its climate.The stream element will provide a way to make Water Line Park both resemble the High Line while also giving it a unique and more innovative approach to naturalized, modern urban space. ​The park is divided into five major areas. At each end of the park, the spaces will be dedicated to woodland species. These spots will be planted with trees such as river birch and redbud. Native shrubs such as spicebush will dot the area. The understory will be a collection of ferns, sedge and shade tolerant perennials. The inner areas of the park will vary from rolling hills, constructed wetlands, meadows and lawn spaces. Two large plazas will be constructed as well. These plazas will be ideal for special events, people watching and group activities. One plaza will be between Faber St and Sharpe Ave. The other will be at Port Richmond Ave. There will be benches throughout the park for people to sit, relax and enjoy the morning, day, evening or night. The pathway will be constructed of customized concrete pavers. The pavers will be made from concrete. Pink and lavender pigments will be mixed into the concrete to create a soft, elegant hue. In the end, the design acts as a stage for nature to shine. The plants, pathway and water are vehicles allowing the visitor to step away from the daily grind and enjoy the good life.